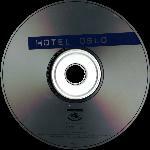 "Hotel Oslo" by Kjetil Bjerkestrand and Magne Furuholmen is the soundtrack album to the TV-movie shown in Scandinavia during January and February 1997. The CD consists of 14 tracks, most of which are instrumental. The album was produced by Timbersound: Magne Furuholmen and Kjetil Bjerkestrand. They have written all of the melodies and lyrics. Swedish Freddie Wadling appears on vocals on several of the tracks. "We Will Never Speak Again" is a duet between Freddie Wadling and Anneli M. Drecker (from Bel Canto) while Magne Furuholmen only does some backing and additional vocals. All of the tracks are listed as rooms. The cover is almost identical to the promo single "In The Hands Of Fools" featuring a slightly out-of-focus picture of a white lamp sitting on the floor beneath a wooden table. The title, in white letters, is placed across the cover on a purple strip. The six page booklet contains details of the featured artists and pictures of them inside a building. The reverse sleeve of the CD shows an unsharp exterior photo of a house with song titles printed over the top in black and white text. There is a black rectangular sticker placed on the outside of the plastic CD case which reads "Vocals by Freddie Wadling "We'll never speak again duet with Anneli M. Drecker" in white text. The actual disc is silver with the title printed on a blue strip across the top.